La Capanna is part of a small farm complex consisting of farm house and renovated barn, the barn 'La Capanna' has a large double bedroom, open plan kitchen/livingroom with double sofa bed and two single folding beds in the, modern bathroom, satelilite tv, outside eating place, garden, . The farm has a large swimming pool (22mx8m) a rather delapedted tennis court, functional however, barbeque, lots of land, olive grove, orchard and woods and spectacular veiws of Chianti hills and mountains, guests are welcome to use our farm produce, olive oil, vegetables fruit, poultry produce and local wine. The farm is within easy walking distance of trattorie, pizzerie and shops. There are many historical villages, churches and lovely countryside nearby. There are also 'Outlets' selling Gucci, Armani, Prada produce within easy driving distance. Florence, Arezzo and Siena can be easily reached by car or train, and for longer visits to Florence we can usualy provide accomadiation. It is a good idea to have car, but there is public transport (bus) , though not frequent, the station is a 15 minute drive away. with frequent trains to Florence, Arezzo; Rome and the other famous Italian cities. The area is famous as the birthplace of the Italian renassance as Massacio was born nearby, and the local Romanic churches /Pievi) are very beautiful. On the mountain behind us and in the valley the other sied are some famous monasteries founded by Saint Frances of Assisi, the monks planted a forest on the mountain many hundreds of years ago and it is still the place where Florentines go to keep cool in the summer. There is a street market in one of the local towns every day of the week, and there are many local 'feste' in the summer. I can give you all the artistic and historic information you need having studied fine arts in Florence. I can provide meals if you want - especially if you arrive late! and and we will provide the basics for breakfast. 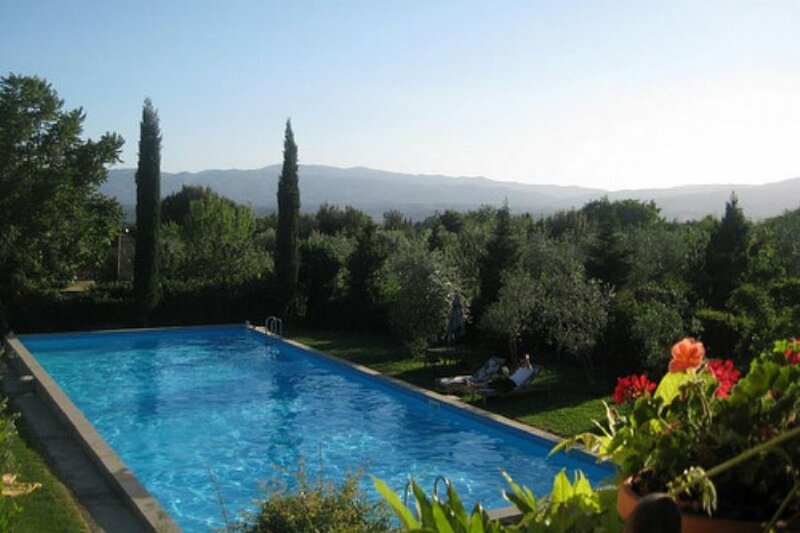 The pool is private to the property, during the midsummer period we have guests in the farmhouse who use the pool, however it is otherwise used exclusively by the guests in the capanna and occasionaly by the owners. The pool and surrounding area are very large. We suggest that the property is suitable for a family with children as there is only one bathroom, we can offer seperate bedrooms in the farmhouse for extra adults.